And with that message, Atheists In Kenya (AIK) President, Harrison Mumia, once again uttered a battle cry to his hundreds of Facebook followers who believe he is a leader into darkness. Another Christian, Josphat Onyando, was even bolder: "We will come and finish you with the word of God, give us the time!! !” he wrote. Harrison Mumia is accustomed to this kind of opposition. When he's not debating Christians and Muslims on social media, he can be found fighting his battles out in court. His legal fight is in response to a decision by Kenya's Attorney General, Prof. Githu Muigai, to refuse to allow AIK to register as an official organization on the grounds that Kenya is a predominantly Christian nation. But Mumia challenges this saying that, according to the constitution of Kenya, the country is a 'secular state.' Mumia faces increased pressure as he wages war because, in the midst of it all, he must also keep his day job at the Kenya School of Monetary Studies which is owned by the Central Bank of Kenya. From all appearances, Mumia is a man who revels in personal conflict. His provocative social media posts prove it. On the first day of 2018, when Kenyans went to work after the Christmas holiday break, Mumia posted ‘Back to work. #WithoutGod.” As usual, his post ignited a heated debate with people on both sides of the issue who were quick to weigh in on the controversy. When the results of Kenya Certificate of Secondary Education (KCSE) were announced last month, Mumia and AIK found themselves in the limelight once again, this time seeking to reward candidates who failed in Christian Religious Education (CRE) and Islamic Religious Education (IRE). “We are offering a token of Ksh10, 000 to top two students who scored grade E in religious studies (i.e CRE/IRE) in the just concluded KCSE,” Mumia announced. Then there was the incident last year when AIK announced plans to hold an Easter Party "without God." In the inevitable firestorm that followed that announcement, Jiweke Tavern - the restaurant where the festivities were to be held - publicly disassociated AIK and Mumia, denying claims that it ever agreed to host the "Godless Easter Party" on Good Friday. "We respect the reason for Easter, it is about Jesus. We are, therefore, not hosting the "Godless party" and have no association with the event or the individual who shared the poster," said Dorcas Njoro, a spokesperson for the restaurant. "Easter is never about Jesus Christ. It is about fun," one of the event posters read. 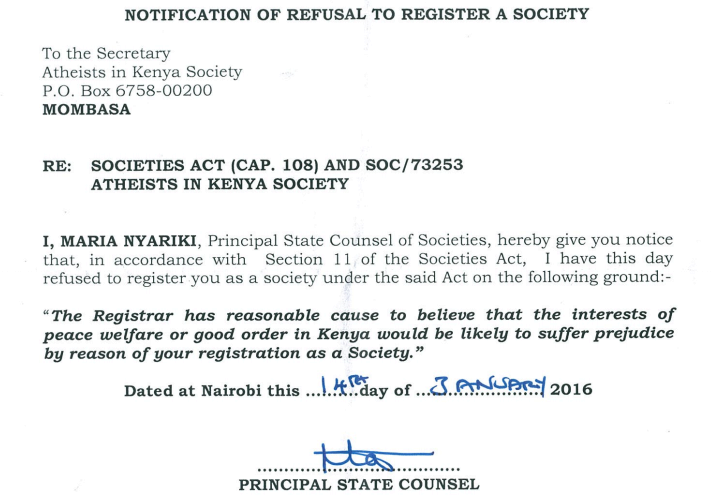 Controversy seems to be at the core of the plight for Kenyan atheists. In 2016, they lodged an online public petition demanding the removal of the name "God" from Kenya’s national anthem. The society said: "As non-believers, we feel that the National Anthem is not representative of us and goes against the spirit of the constitution." They argued the removal of the word 'God' would make the anthem more inclusive since "not all Kenyans believe in the existence of God." (They were referring to the first line of the national anthem whose lyrics are: Oh God of all Creation). And when Pope Francis visited Kenya in 2015, the government - in deference to the Pontiff - declared a national holiday, a move that miffed the AIK and sent Mumia back to court. His argument was that observing such a holiday was "unfair, contemptuous of the constitution and discriminatory" because it violated provisions in article 8, 9 and 32 of the Kenyan constitution. But the fight to have their 350 member association registered is where Mumia and his followers have faced their toughest battle yet. At first glance the government did not seem to have much problem with AIK and proceeded forward with registering the organization. But all hell broke loose when Christians and Muslims found out and were suddenly on the same side of the boxing ring, slugging it out with a common enemy: atheists. Muslims’ Shuura Council chair Abdullahi Abdi led the Mohamedans in opposing the registration, saying it “mocked Kenya’s national norms" and demanding the decision be rescinded. In support, the Kenya National Congress of Pentecostal Churches and Ministries Vice Chair Bishop Stephen Ndicho said, “It is fool-hearted to act as if there is no God, and worse, to register an association to make it official." Ndicho continued, “As people who believe in God we register our disgust to the AG and the way he has casually and in utter contempt been handling these religious issues. He has now touched the nerve of every person of faith by registering a society that denies the very existence of God,” he lamented. In response, the State Counsel of Societies refused to register AIK as a society on the grounds that "the interests of peace welfare or good order in Kenya would be likely to suffer prejudice" as a result. A defiant Mumia refuses to back down and says the AIK has rolled out many activities to popularize the association with a view to attract even more members. Because of his work with AIK, Mumia has achieved a celebrity status of sorts and is often on radio and TV stations promoting atheism. Last May, Mumia and AIK received a rare backing when a leading television host, Larry Madowo, came out in their support. Today, more than 80 percent of the 46 million residents of Kenya identify themselves as Christian. The remaining 20 percent of the country is a combination of Muslims, Hindus, traditionalists and atheists.